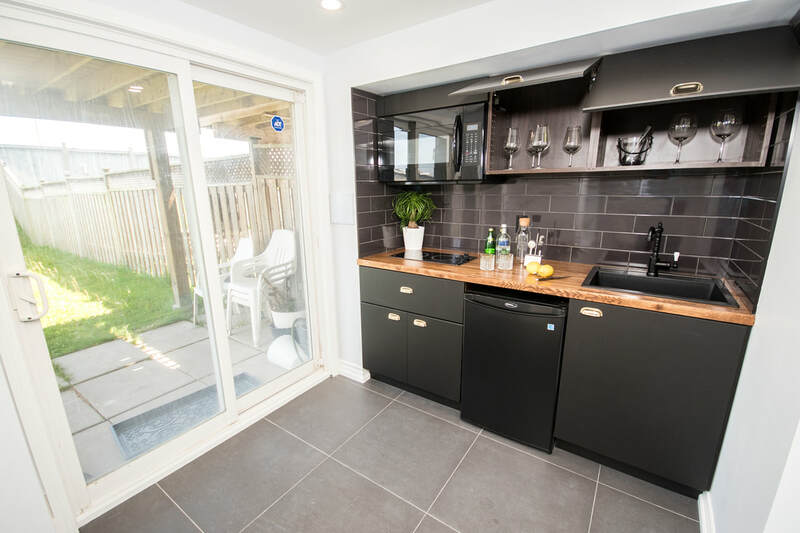 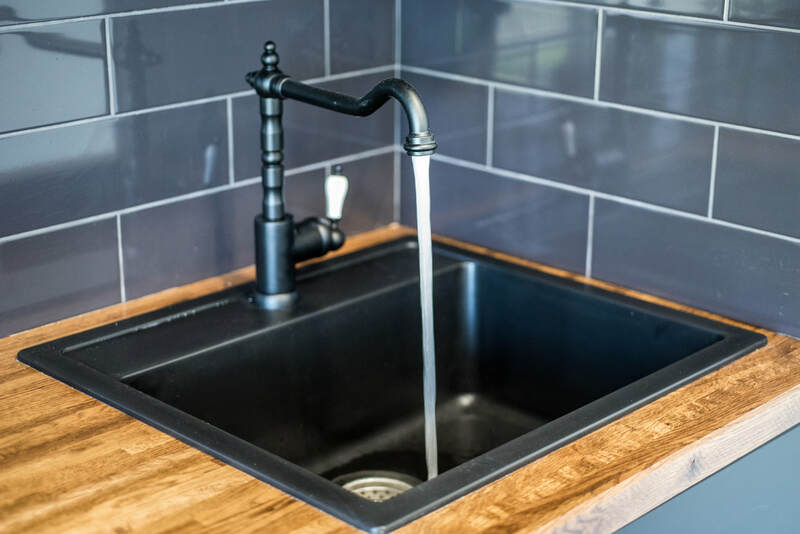 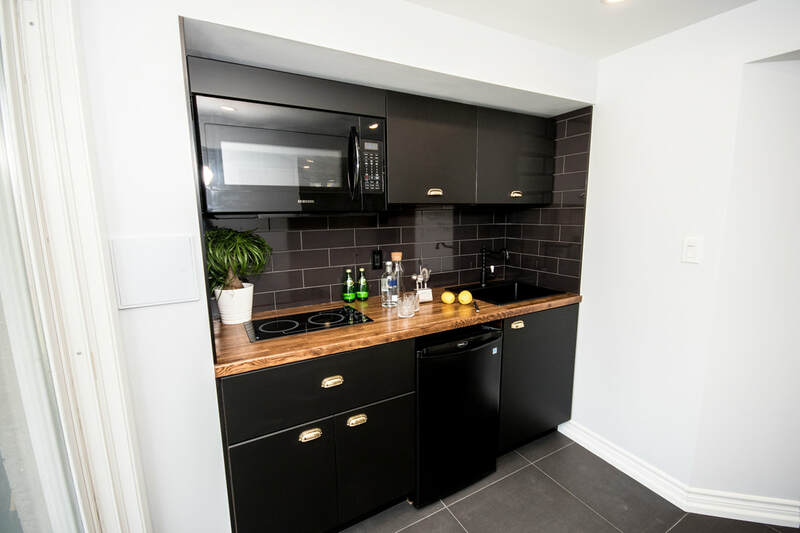 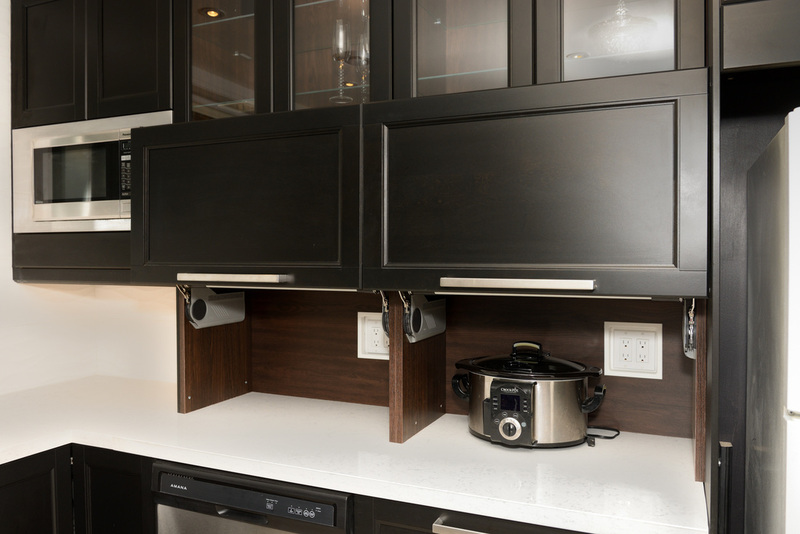 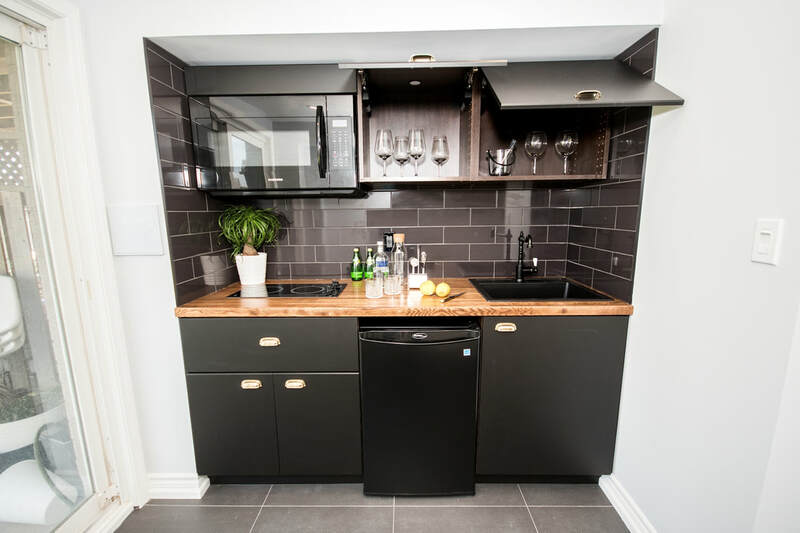 ​This walkout basement was kitted out with a compact kitchenette with sleek cook top and all black appliances, sink and faucet, Details such as the solid oak butcher block counter top stained in walnut and the cute brass handles finish off the space. 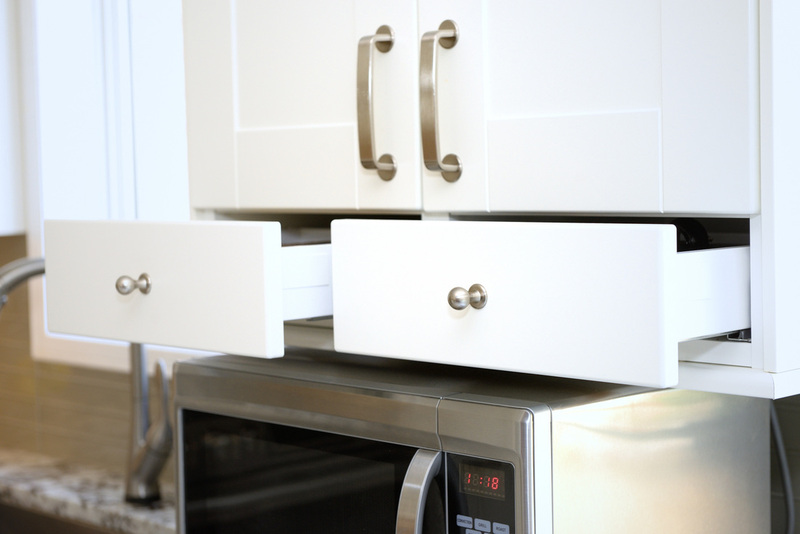 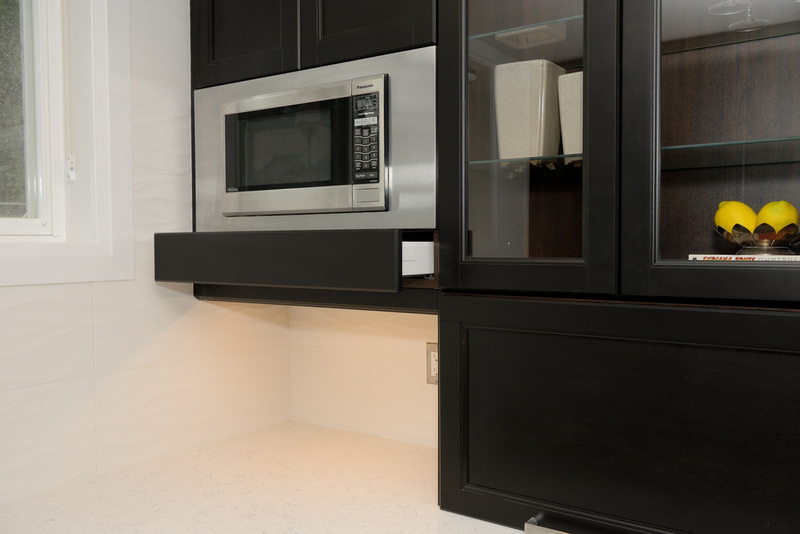 Top opening cabinetry and a microwave mounted above the cook top create a stunning kitchen space in an all white basement. 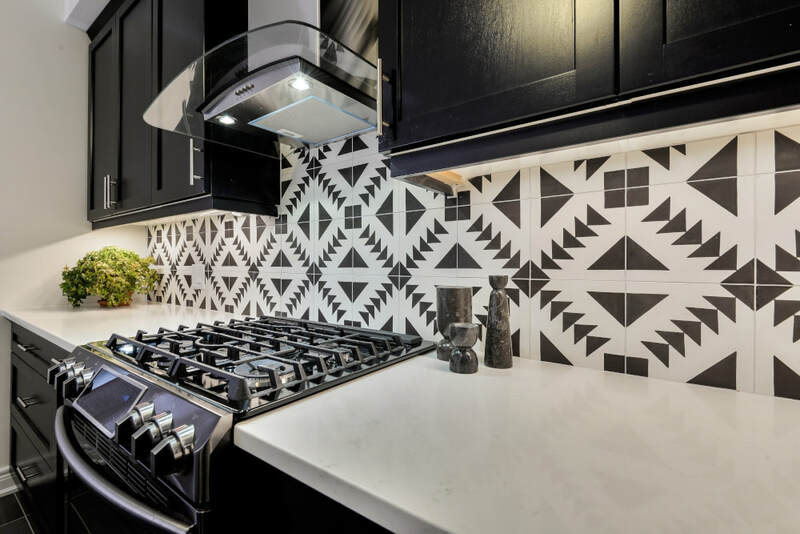 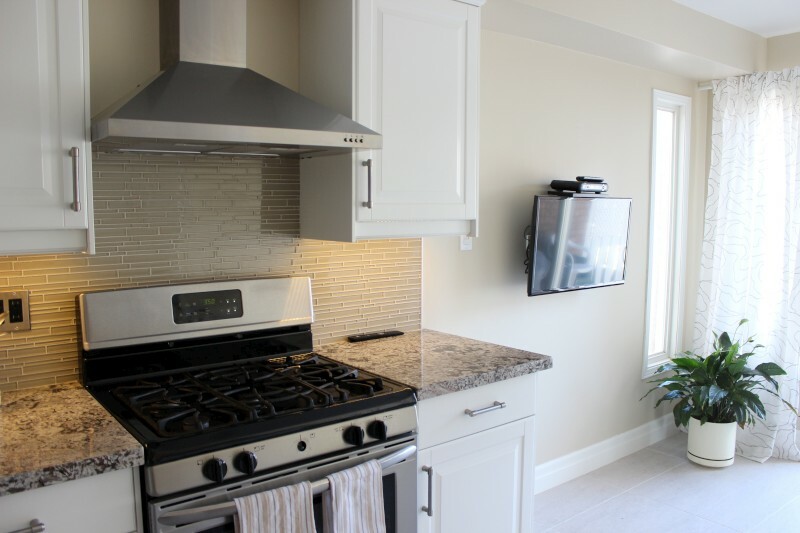 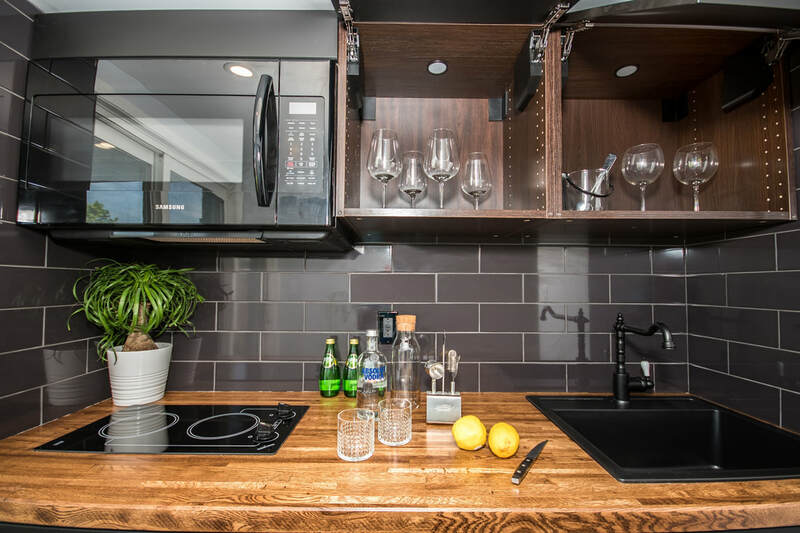 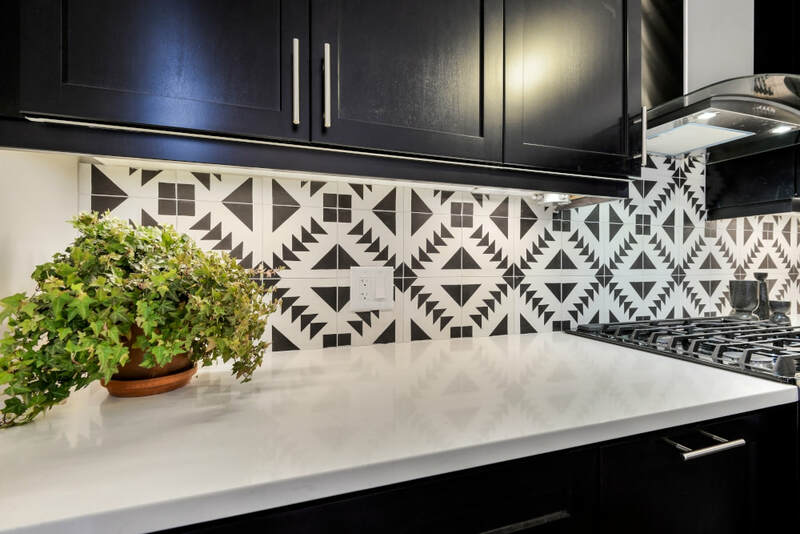 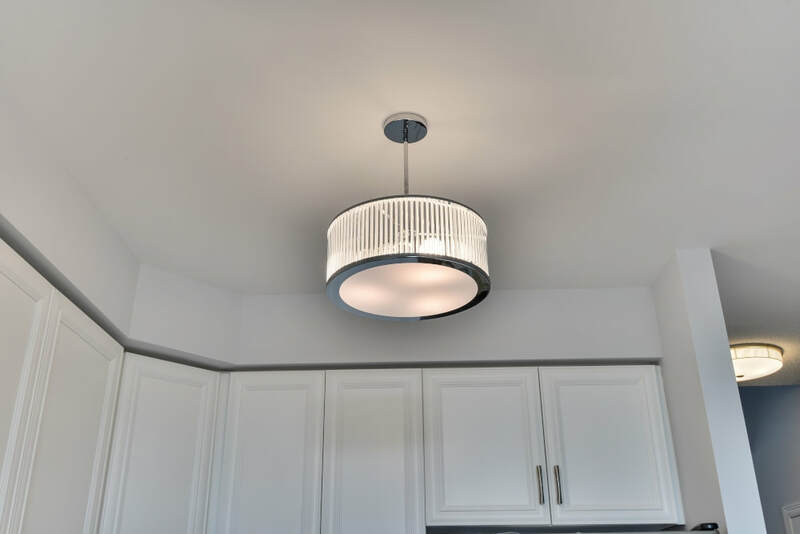 This builder's grade kitchen was given a brand new back splash, new range hood, under counter lights and spot lights in the corner cabinet to turn it into an uber chic space. 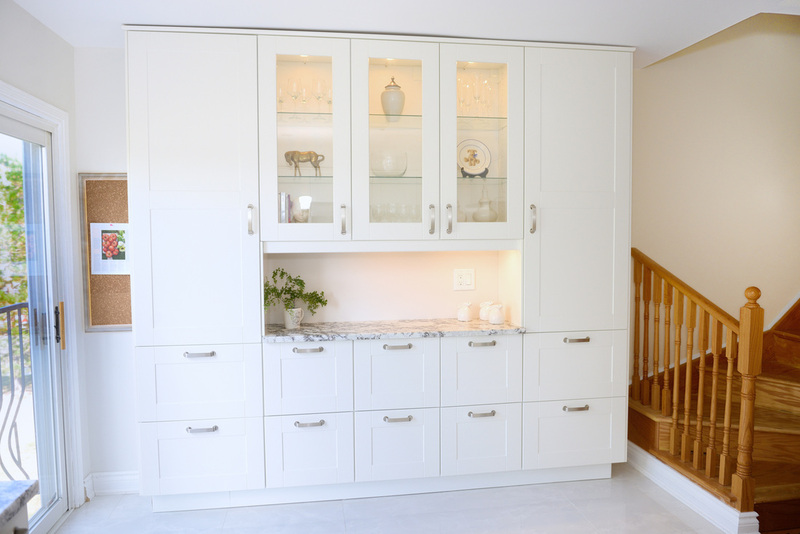 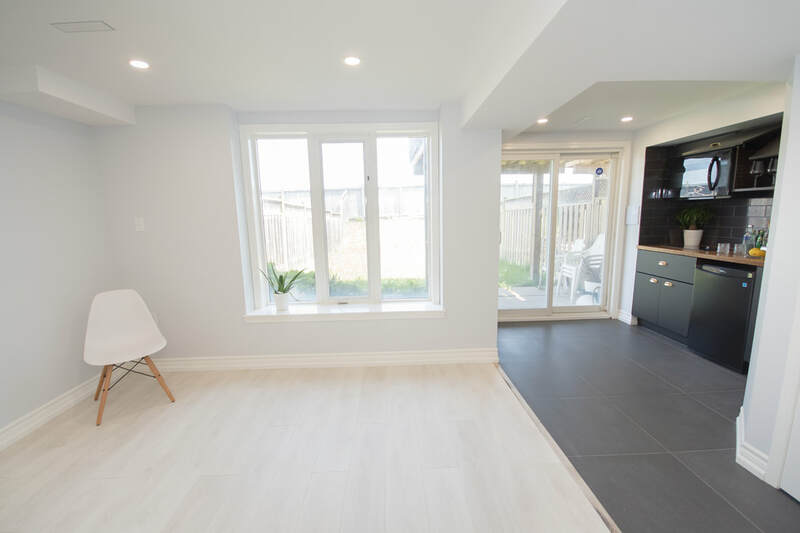 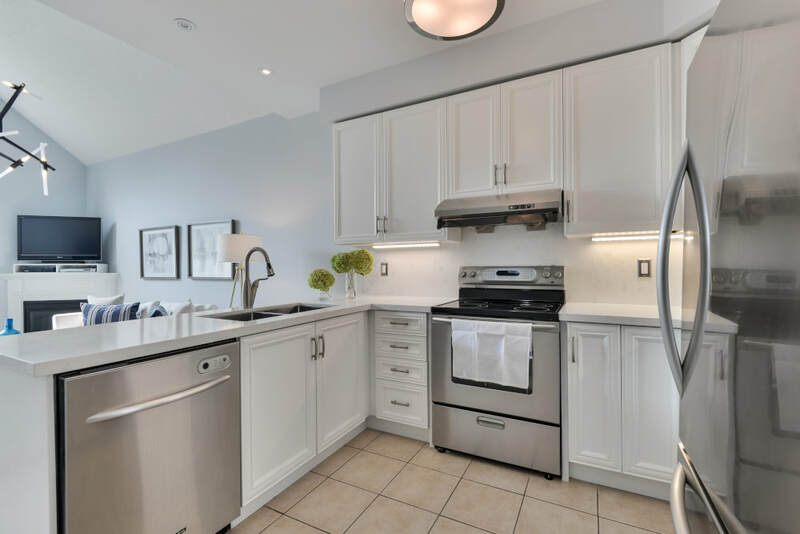 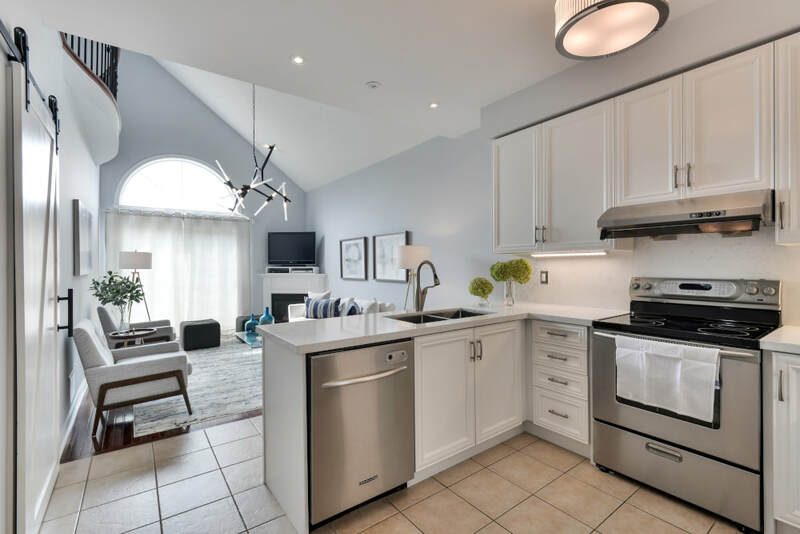 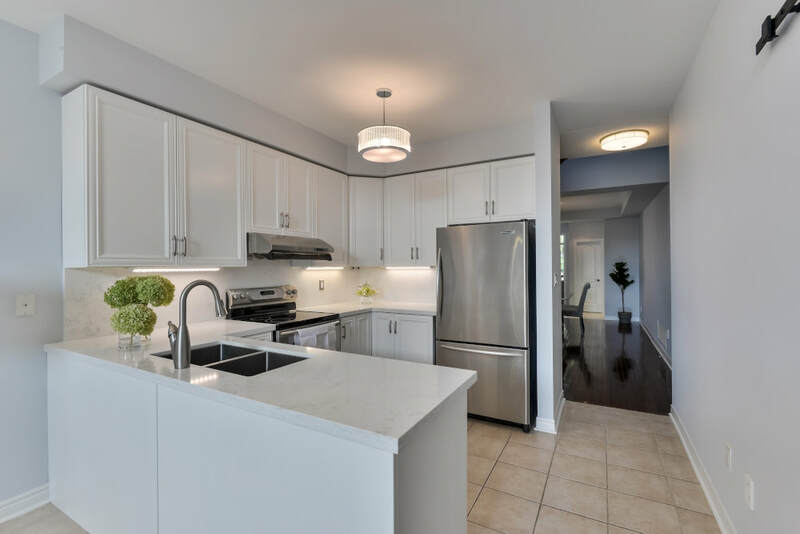 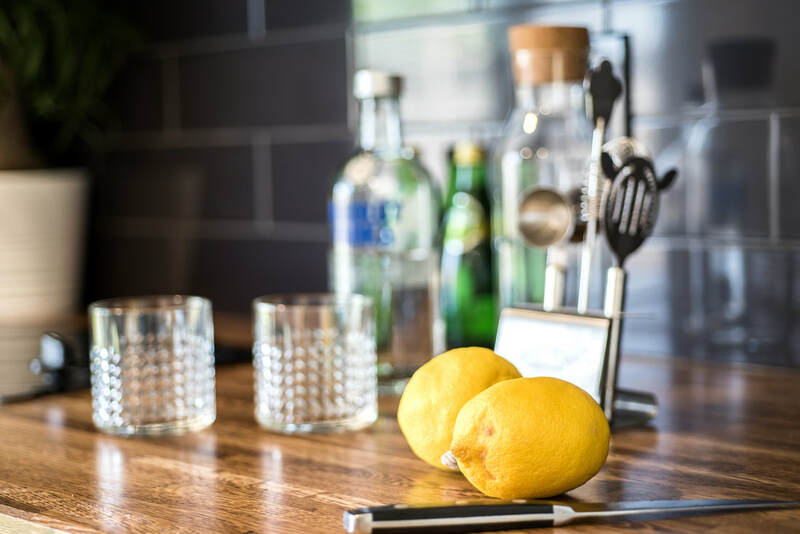 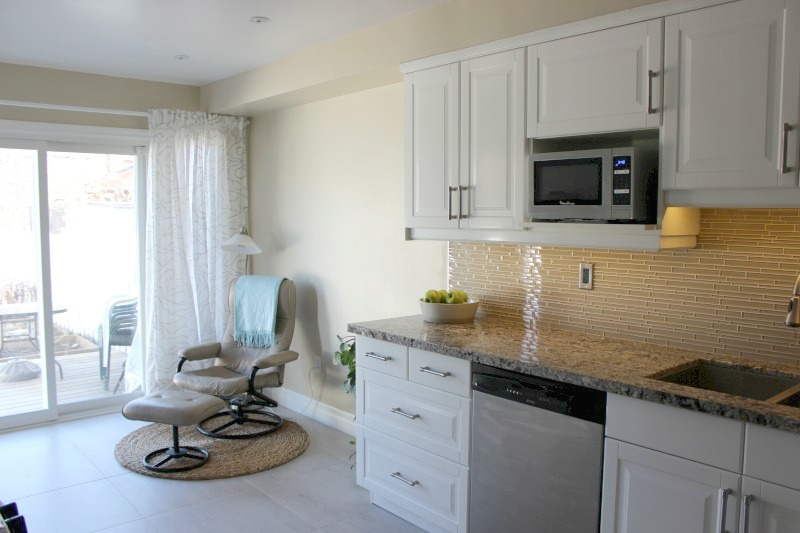 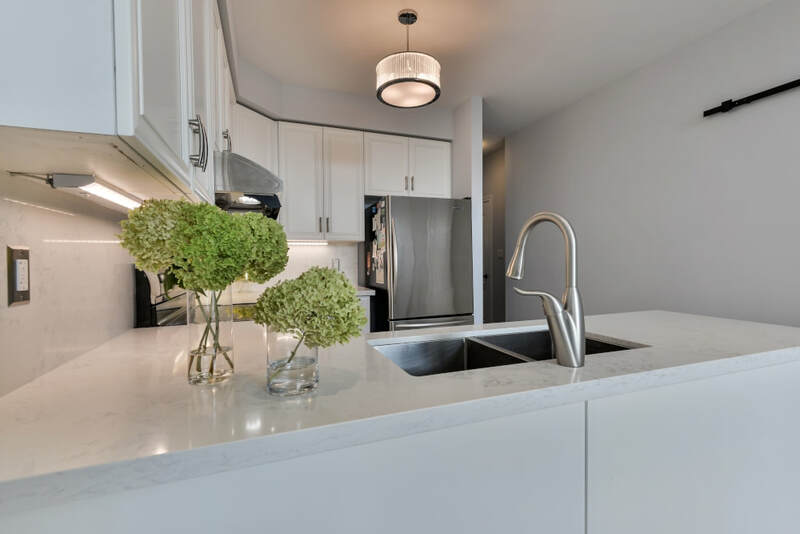 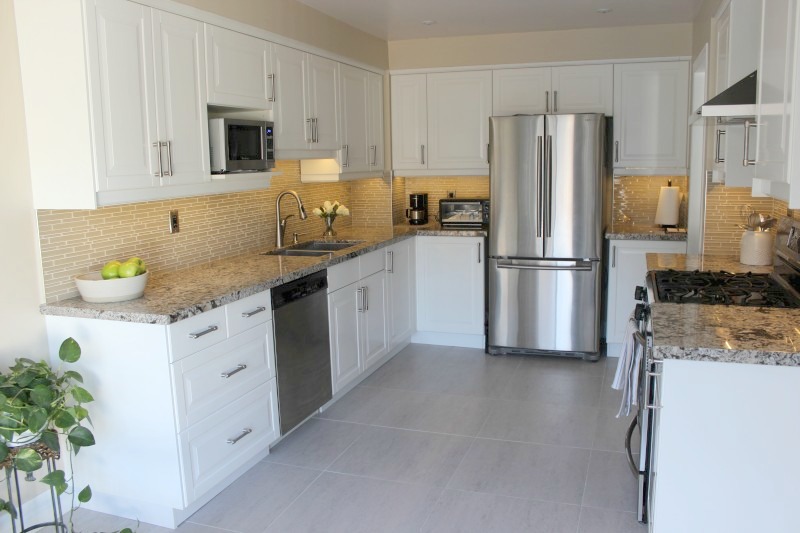 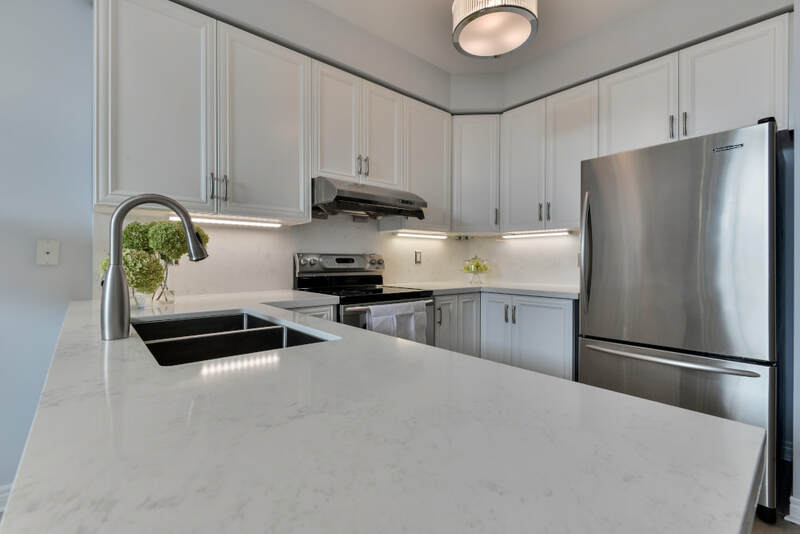 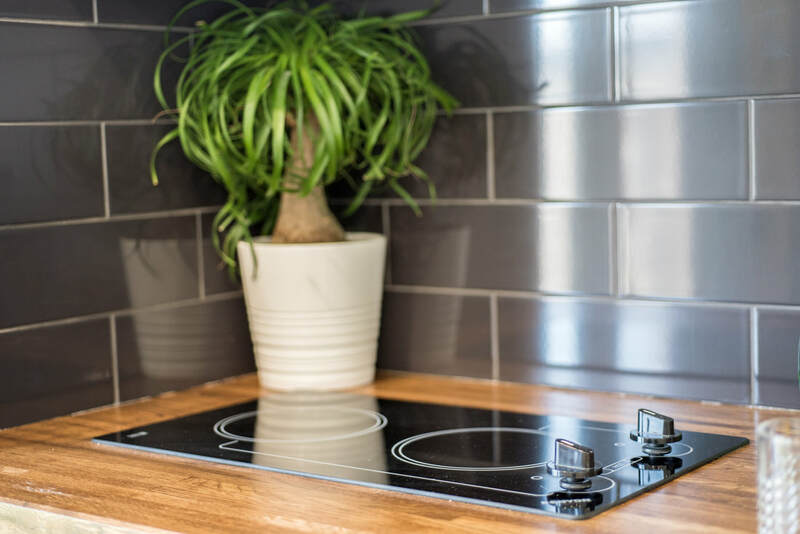 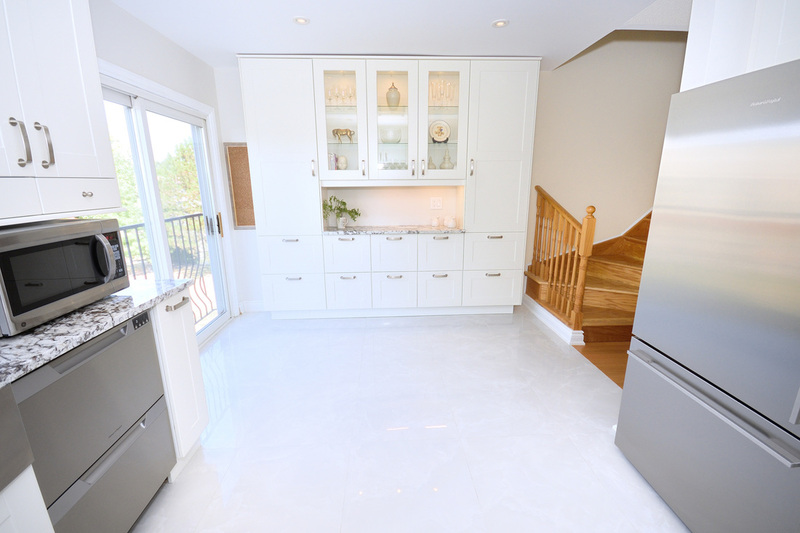 This open plan kitchen was given a complete makeover by professionally refinishing the cabinetry, new quartz counter tops and matching seamless back splash, sleek new hardware and chic lighting. 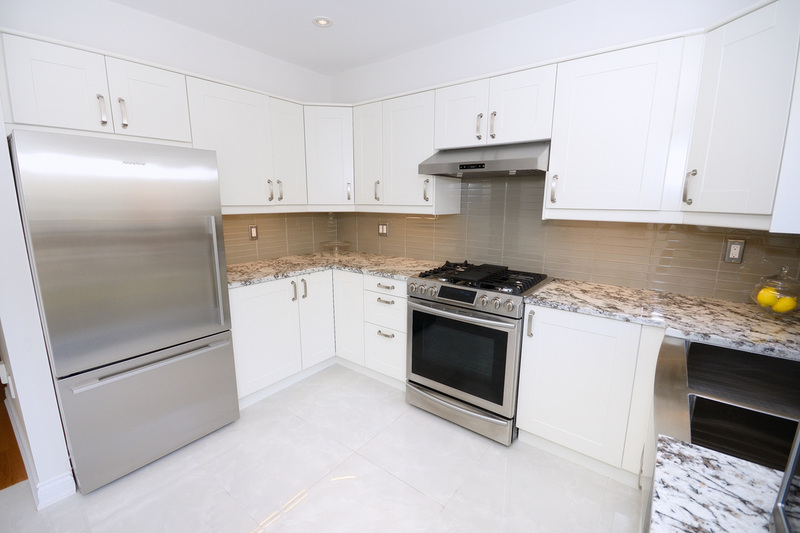 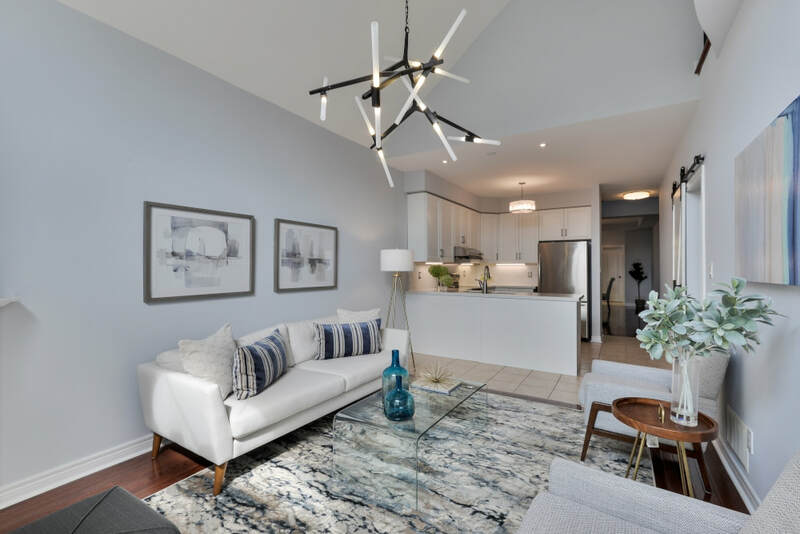 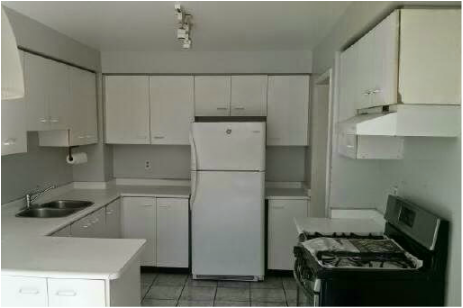 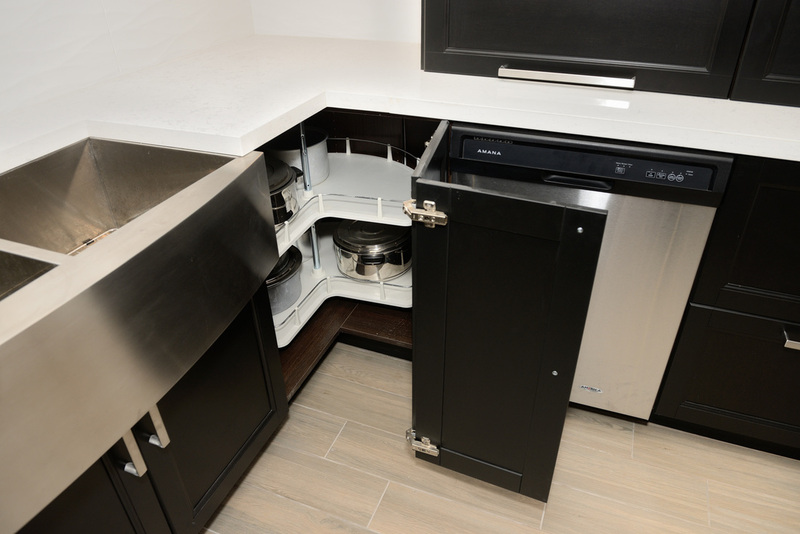 Featuring custom cabinetry, floor-to-ceiling spice rack, two appliance garages, double drawers, custom bezel for microwave. 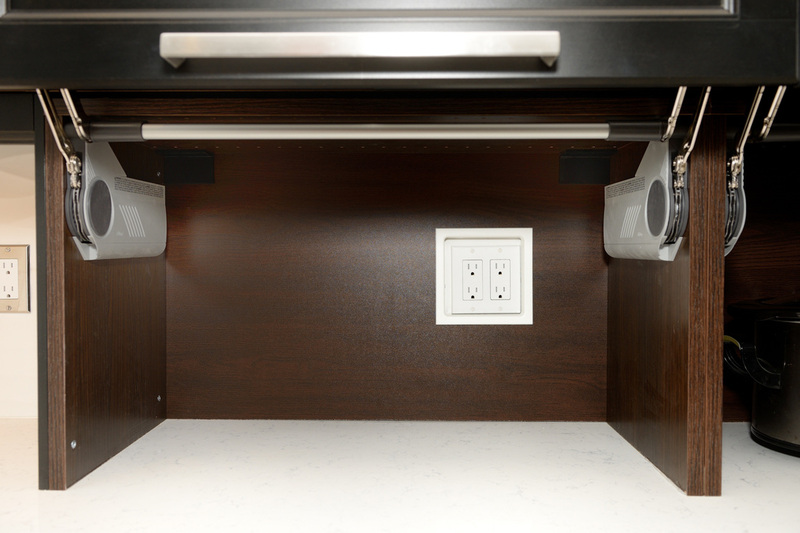 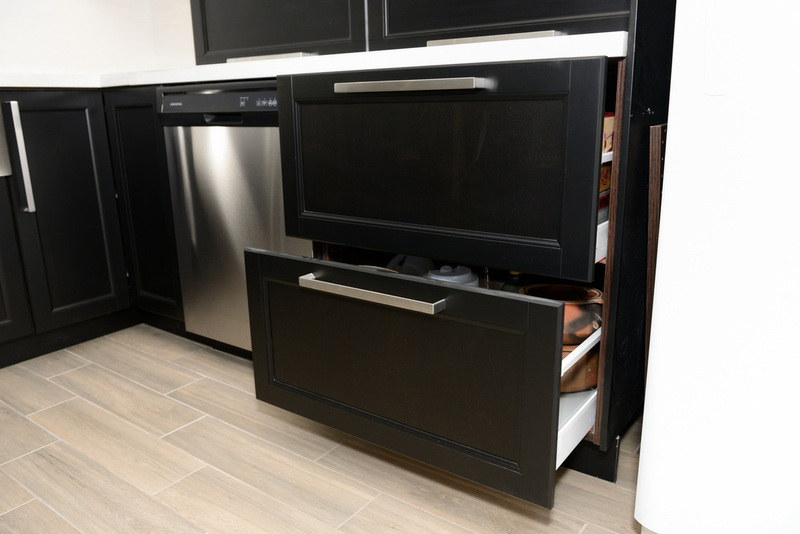 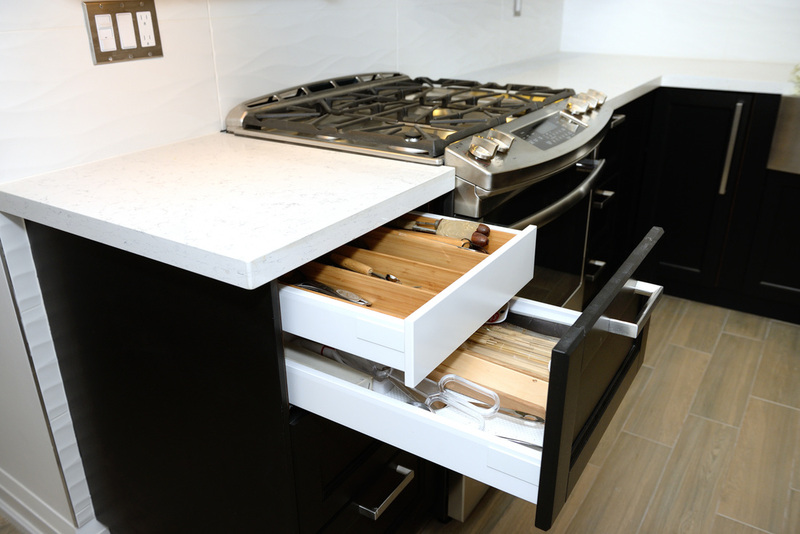 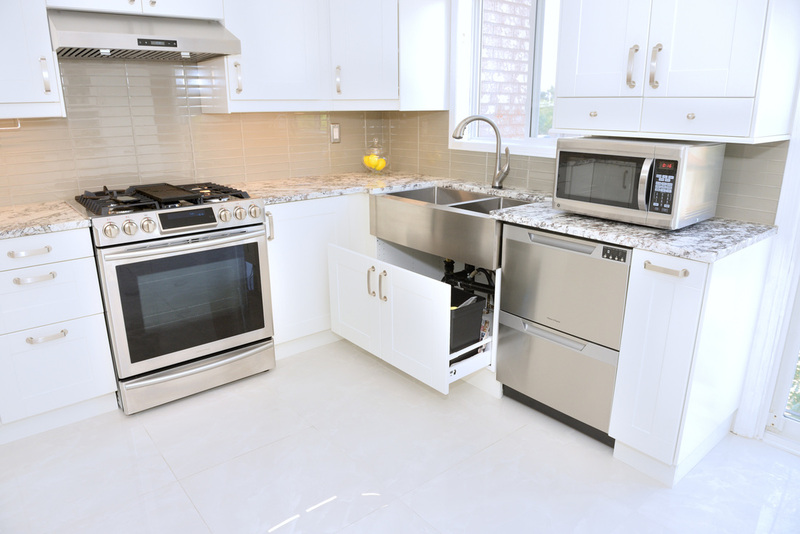 hidden drawer under microwave, blind corner pull out carousels, additional storage options, farmhouse sink, 700 CFM rangehood, custom glass door cabinets, integrated lighting and much more. 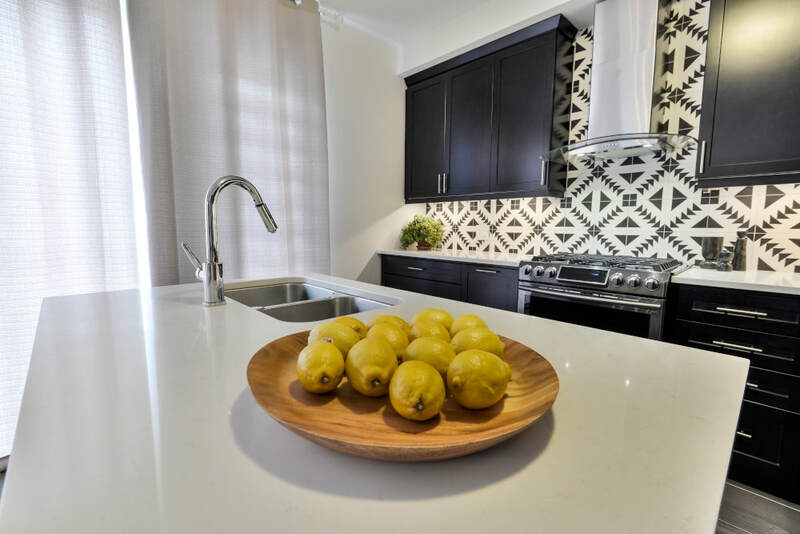 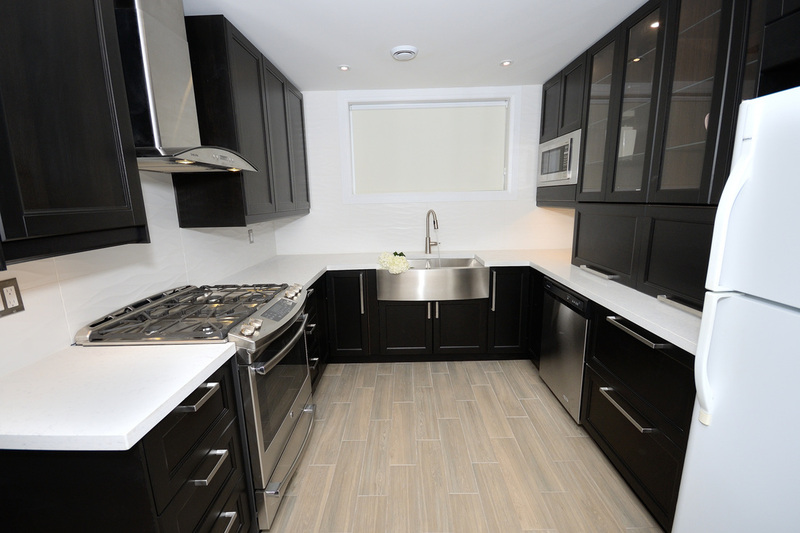 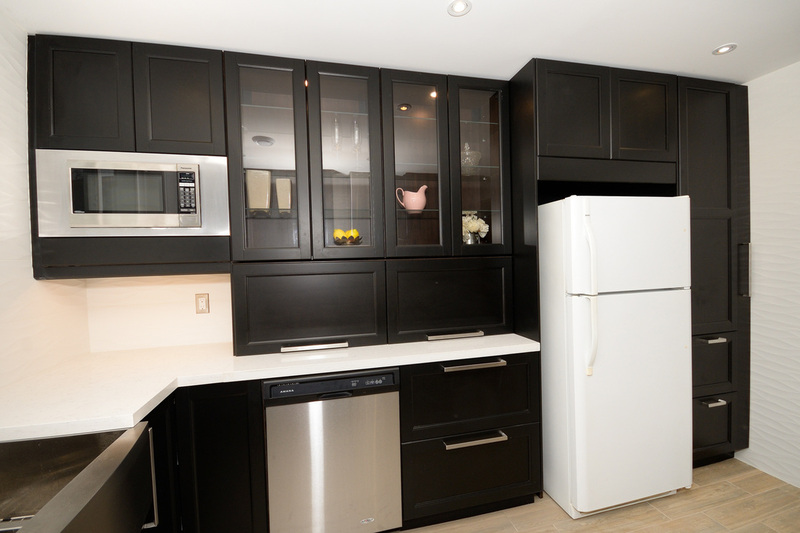 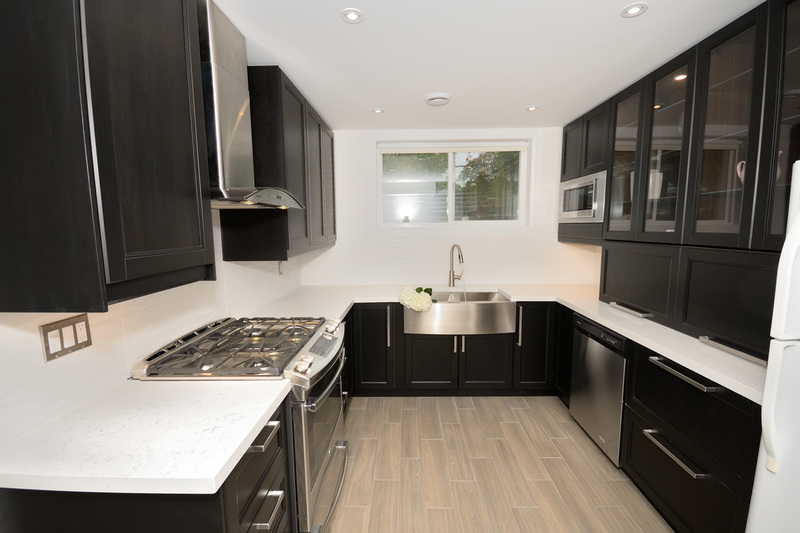 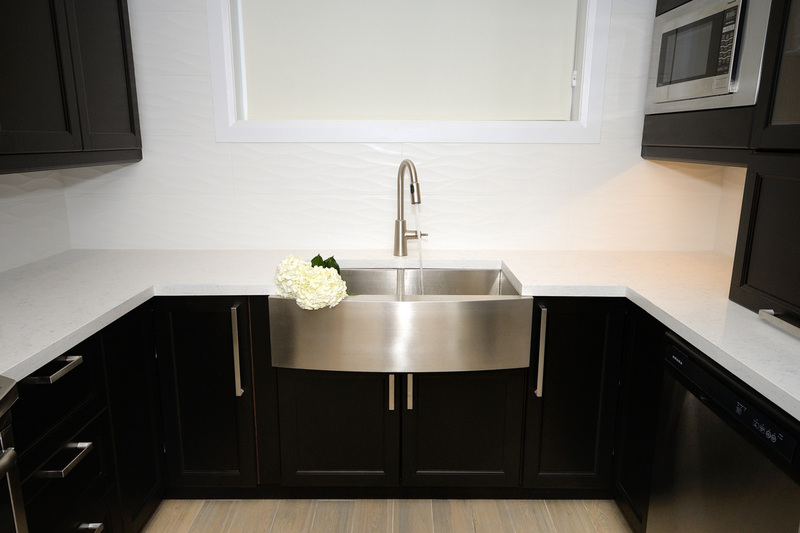 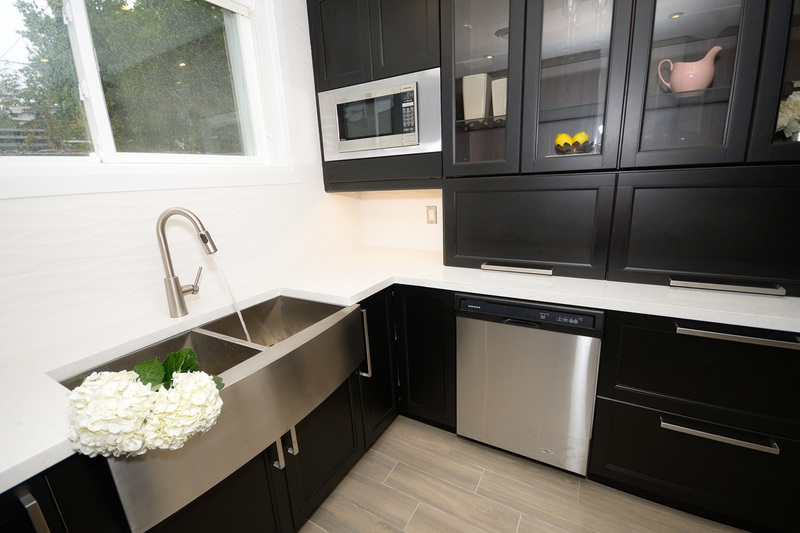 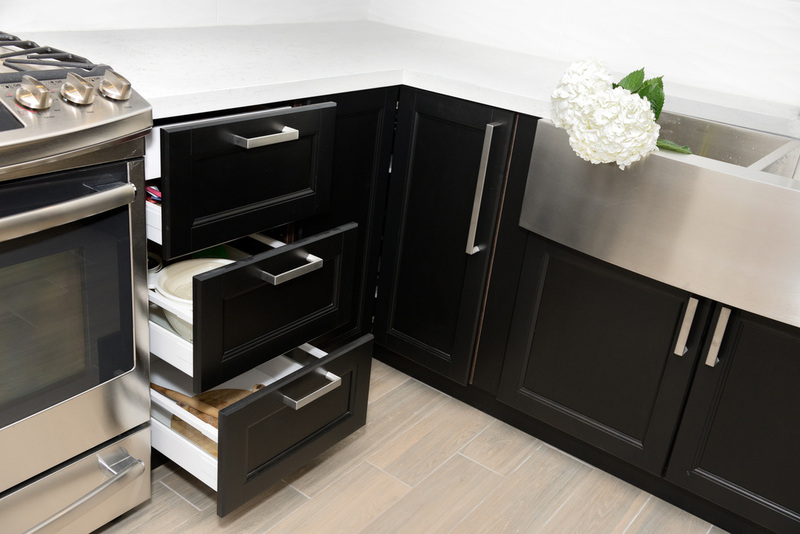 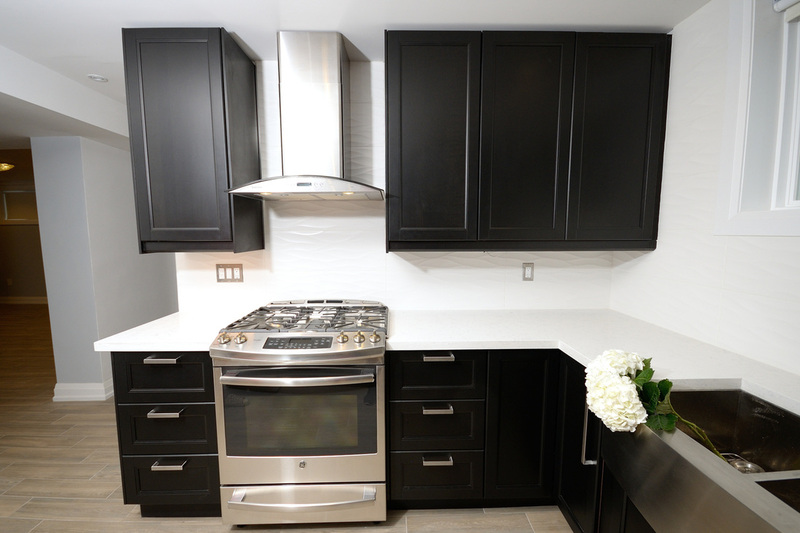 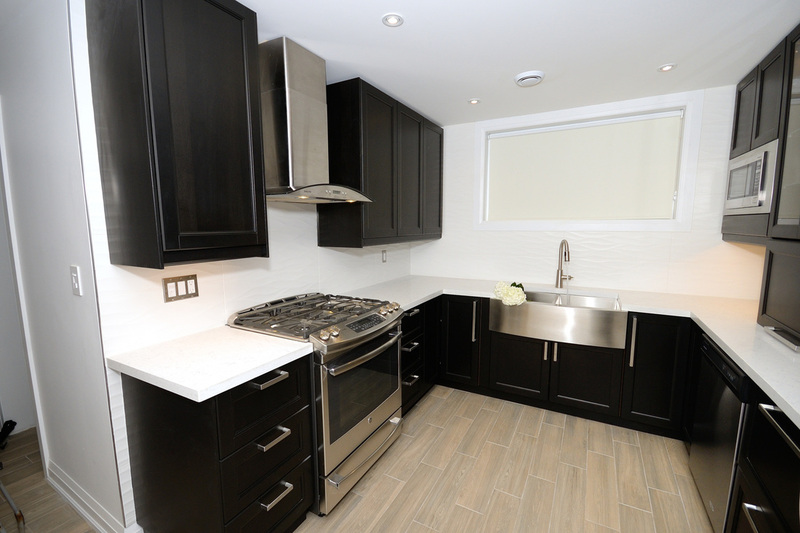 This beautiful kitchen features all black cabinetry with white quartz counter tops. 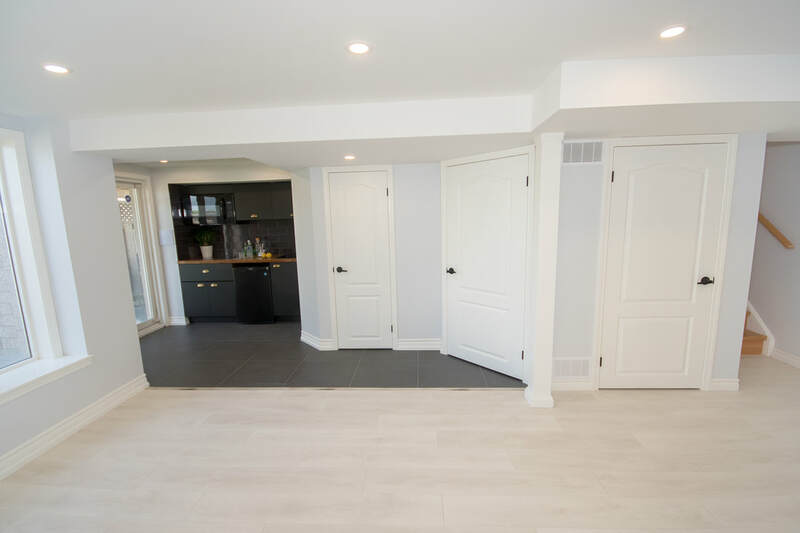 Gorgeous white textured tiles on the walls and wood look grey/brown porcelain tiles on the floor added a sense of luxury to the space. 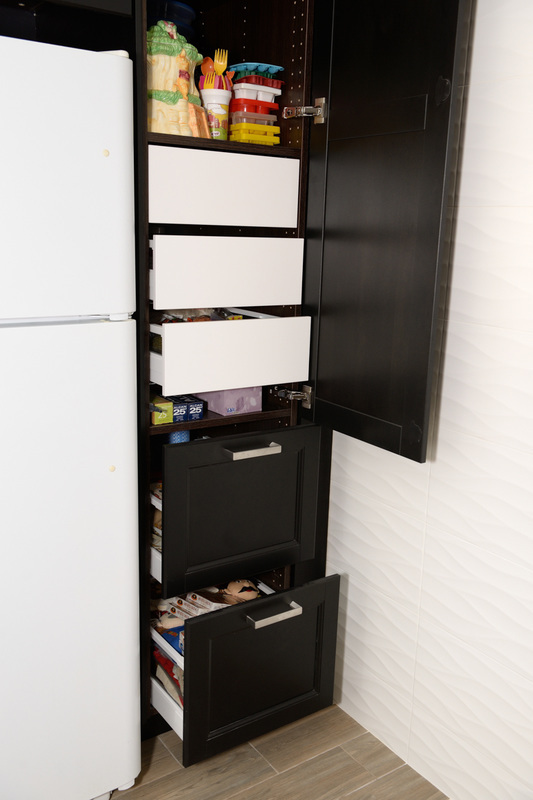 A 90 inch custom built SPICE RACK was purpose built to fit into the otherwise wasted space at the end of the cabinet run. 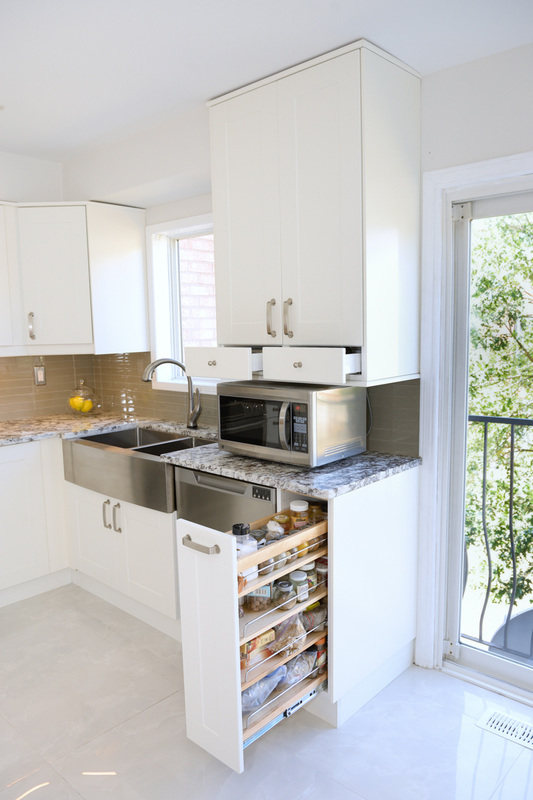 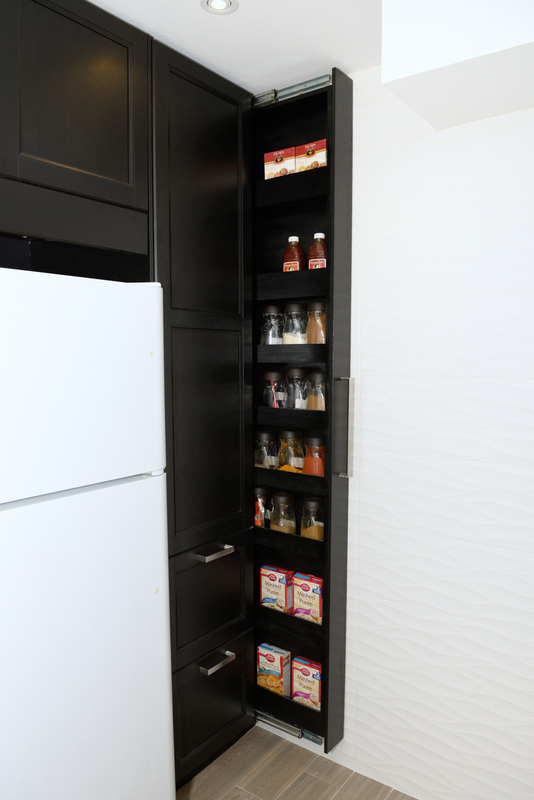 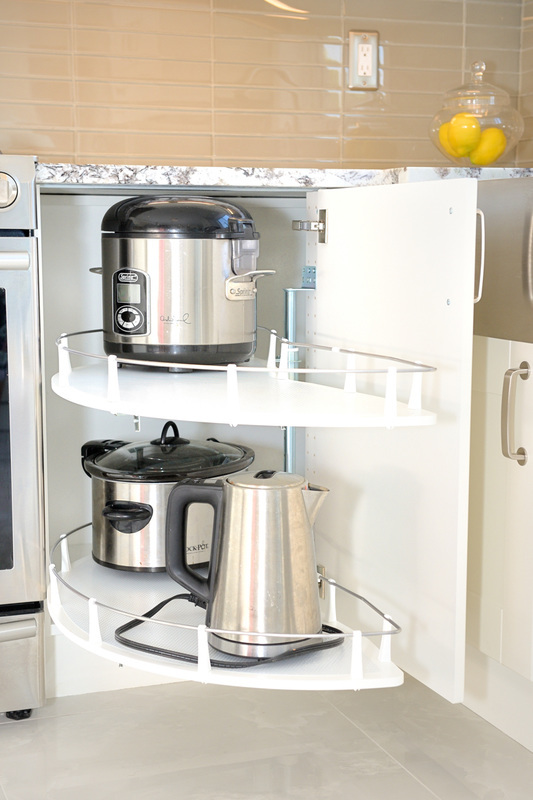 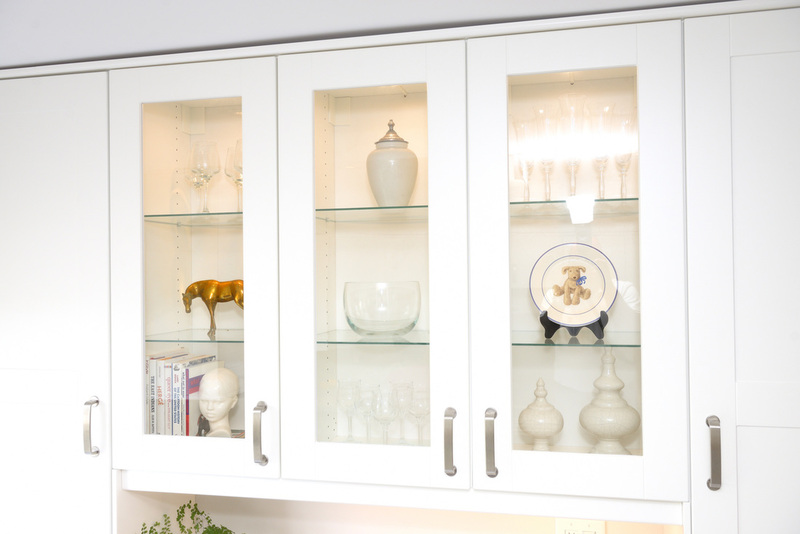 PANTRY UNIT features shelving and many pull out drawers for additional storage. 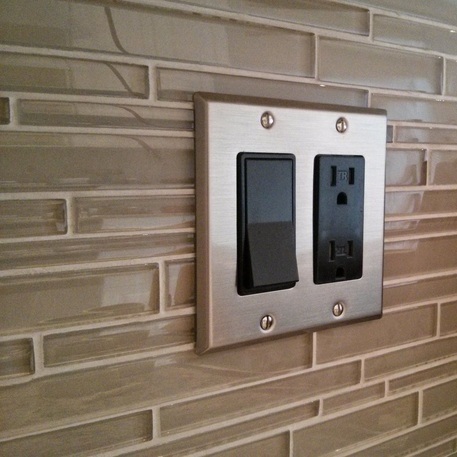 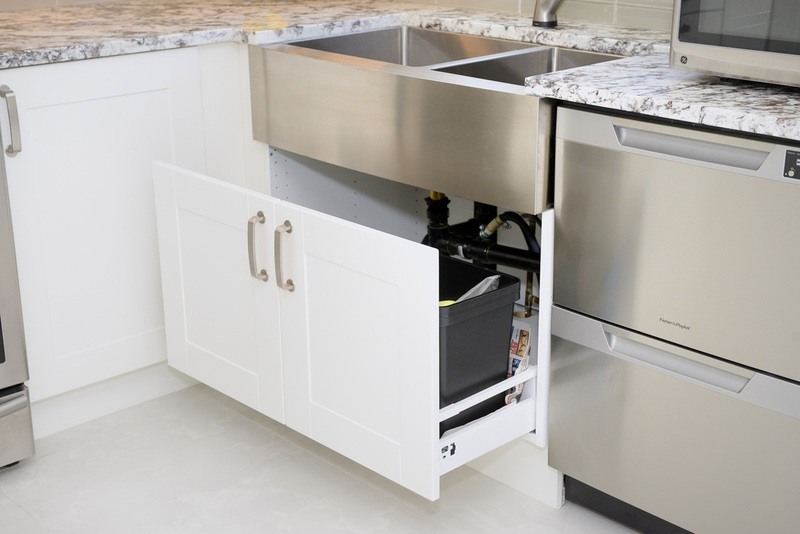 Custom Built Dual APPLIANCE GARAGES featuring dedicated circuitry per duplex socket. 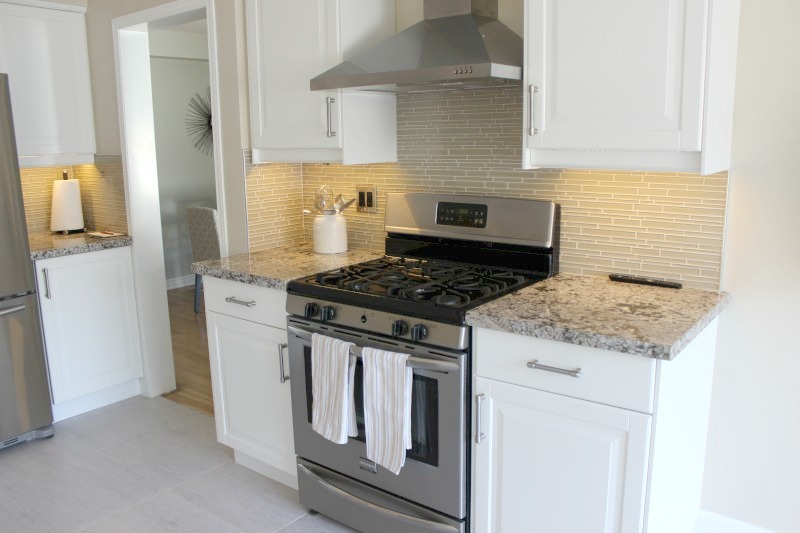 Custom cabinetry, custom spice rack, a pull-out waste organizer under sink, double drawers above microwave, bank of cabinets for additional storage on opposite wall, farmhouse sink, 700 CFM rangehood, slide-in gas range, double drawer dishwasher, blind corner pull-out carousel. 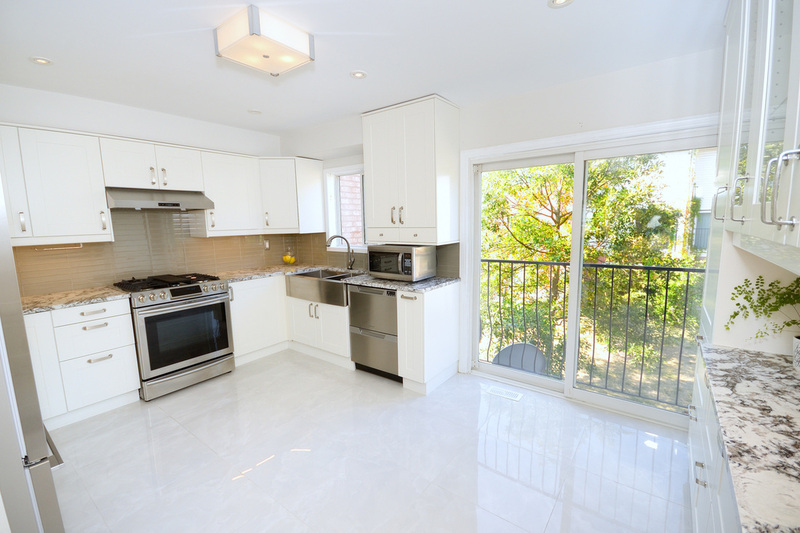 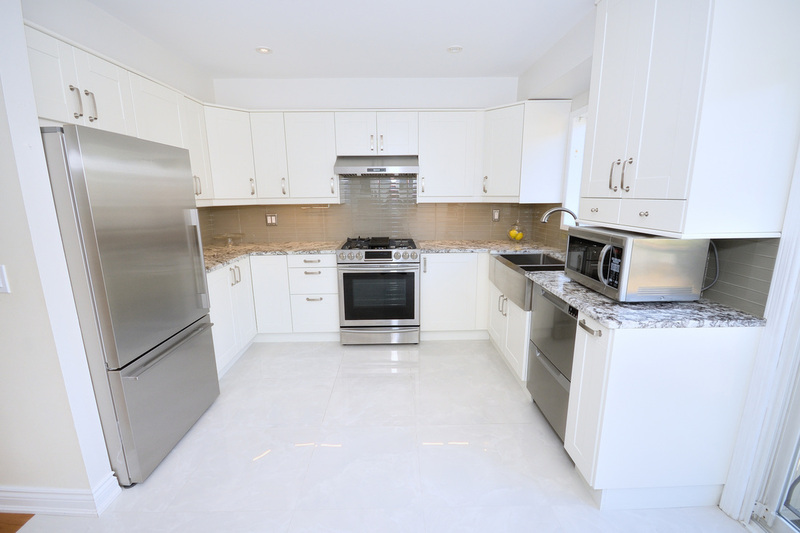 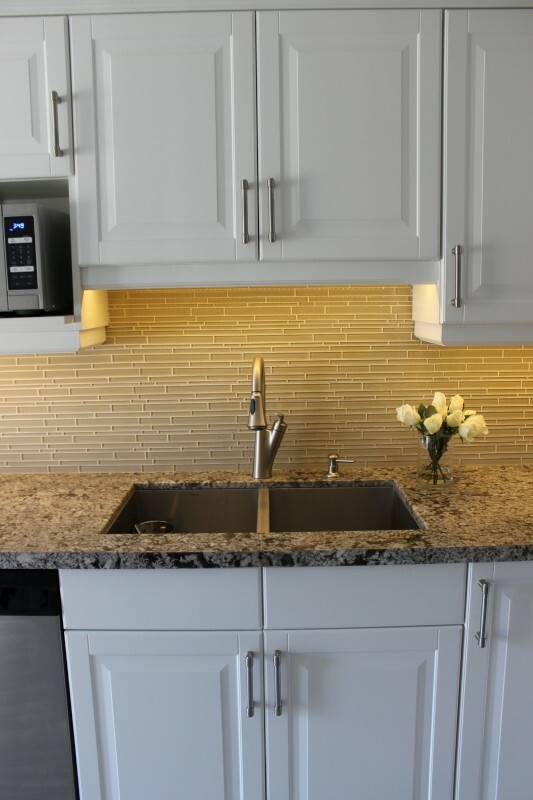 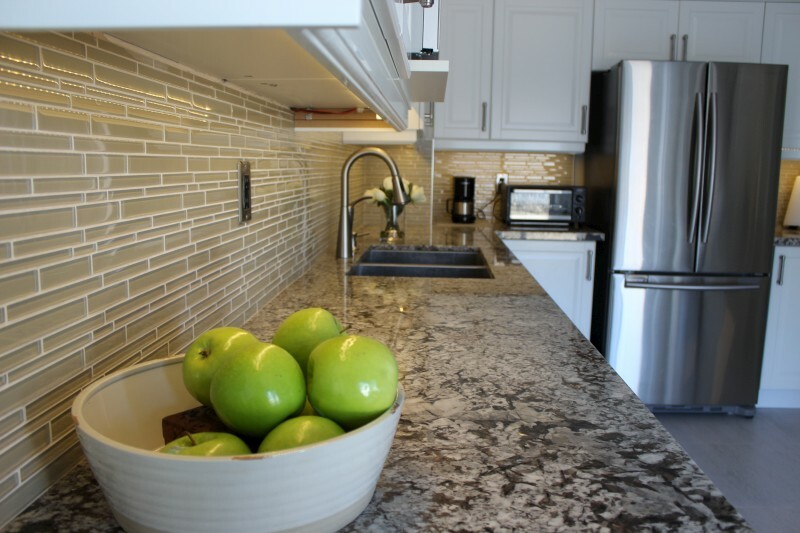 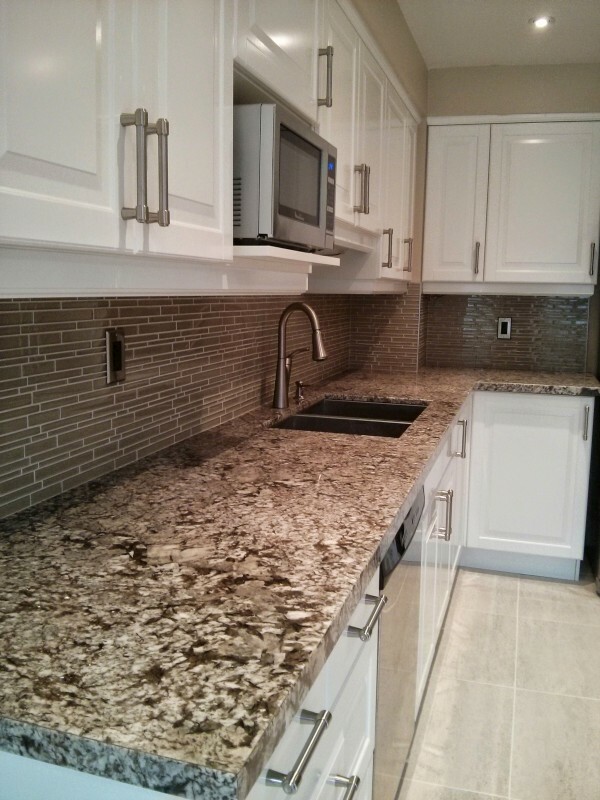 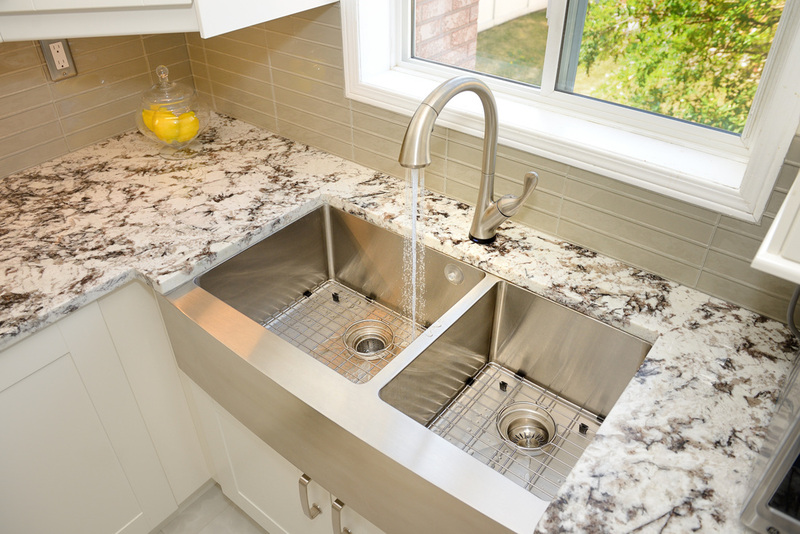 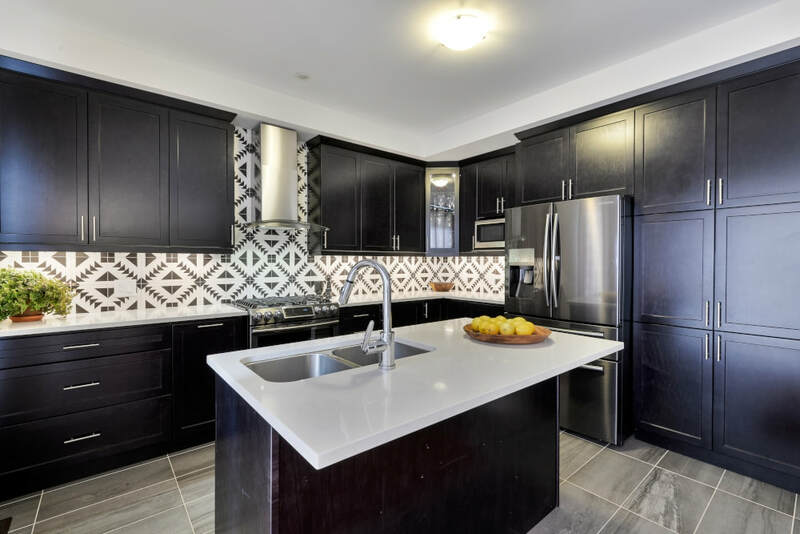 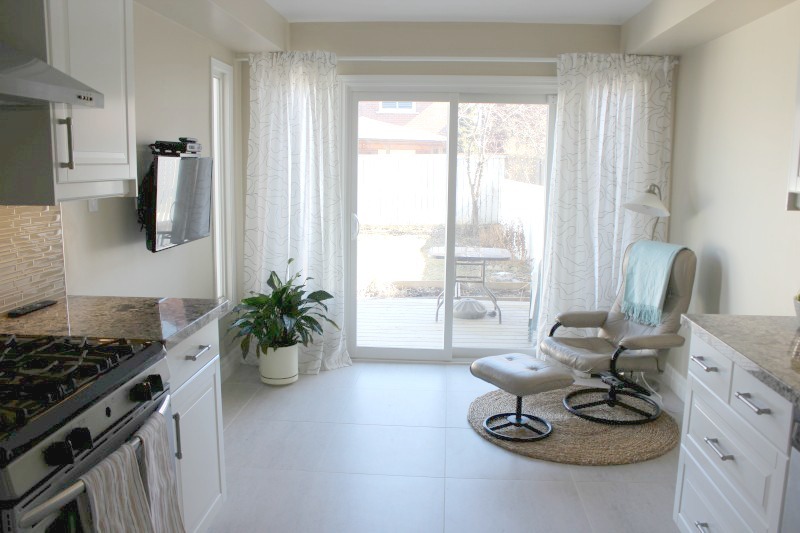 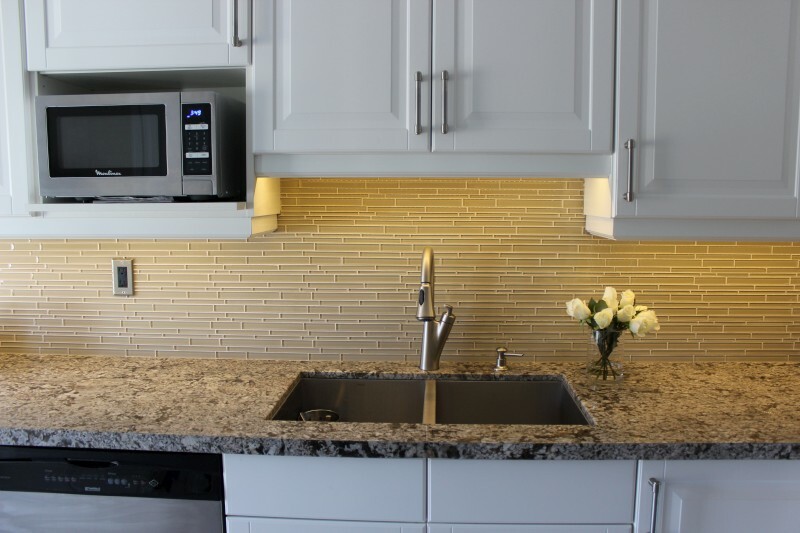 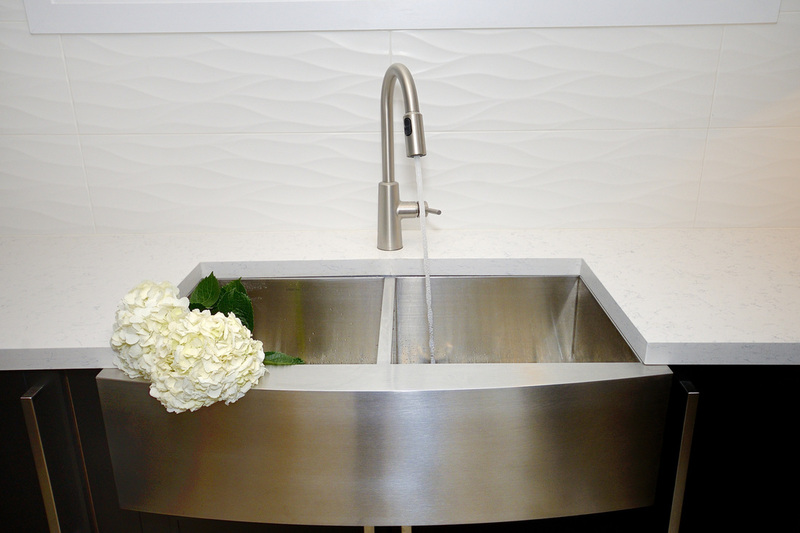 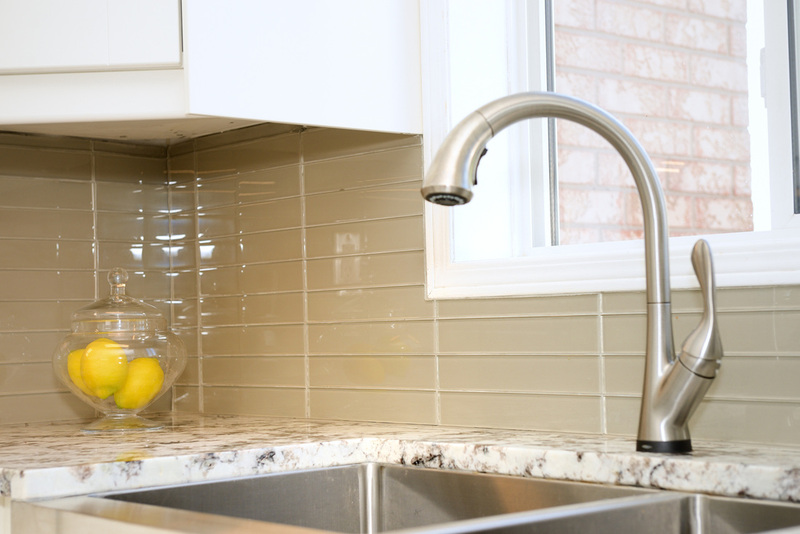 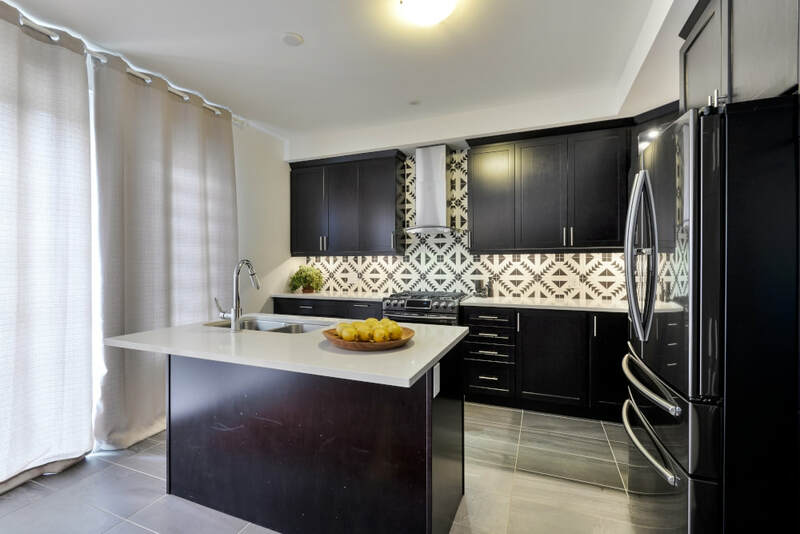 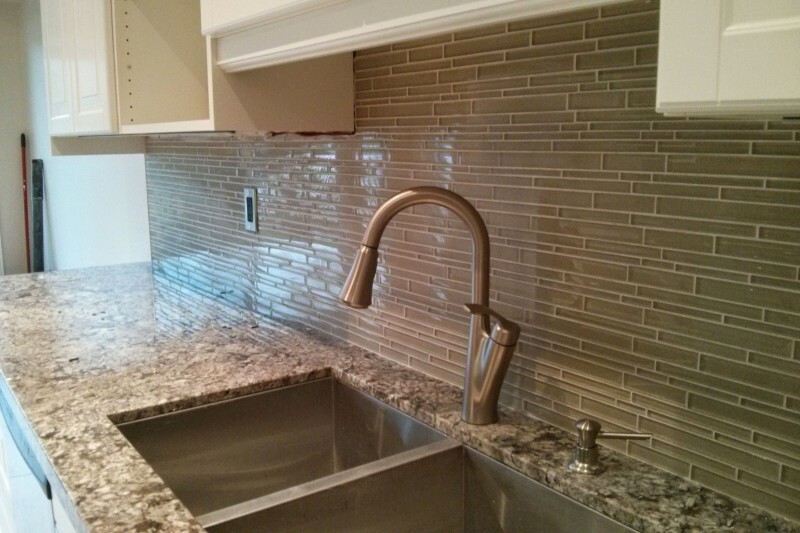 All cabinetry, back splash, floor tiles, counter top chosen by Wilde North. 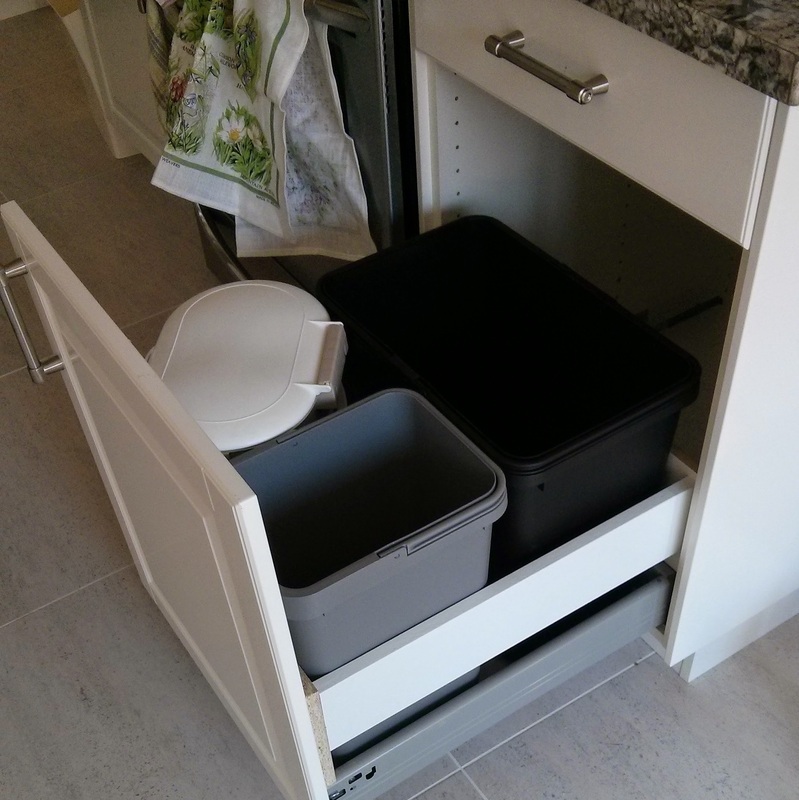 Custom storage solution for recycling bins.